Kale Yay! 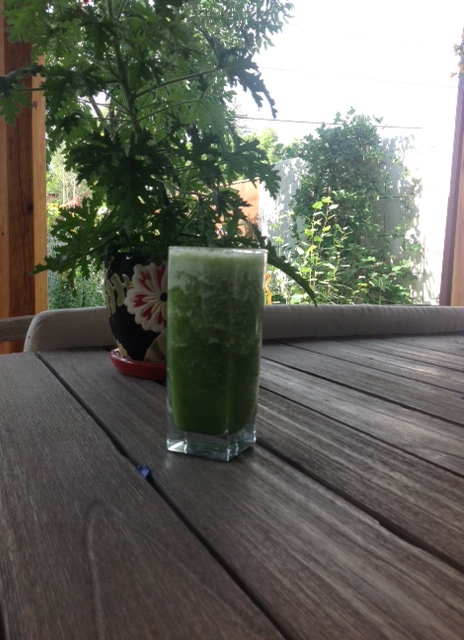 Healthy Green Smoothie Lemonade! So this morning I was feeling a little low in energy. Didn’t sleep well and then our new puppy decided 5:30 am was a prefect time to get up! I thought what could I do to perk myself up and also nourish my sleep deprived body! Well I have tons of kale growing in the garden, some lemons, ginger in the fridge and organic cukes from the farmers market. How bout I take all those and throw them into the Blendtec and see what comes out? Let me tell you DELISH! This is not some fru-fru, fruity drink that makes you think you are getting a green smoothie down, this is the real deal. Loaded with tons of greens, nourishing and detoxing lemons, great fiber and stomach soothing ginger! It’s like eating a refreshing salad in a glass. 16 OZ of filtered water, you can add more water if you like then thinner. Place everything in a high-speed blender and blend away. I keep large knob’s of ginger in the freezer and just grate what I need with a microplane. I never used enough before it went back and this is a great trick. I do this with Turmeric too! I added a couple of ice cubes when I was done to make it nice and cold. It may have been the beautiful green color or just the idea of having something healthy, but I was able to have a busy and productive day with clients all day and prepare for my group class tomorrow night. I felt energized and ready to focus on my tasks. This recipe serves 2. I took the second part, in a mason jar, in the afternoon to work, to help with that mid afternoon slump! ← Summer Splash Kit and Yummy Recipes!